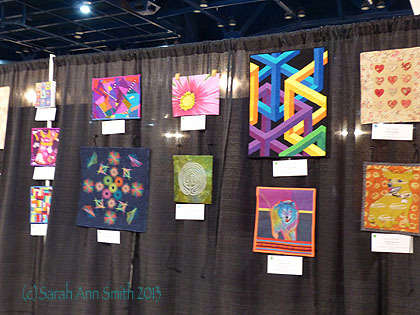 Art and Quilting in Camden and Hope » Blog Archive » International Quilt Festival, Houston, 1 of many posts! 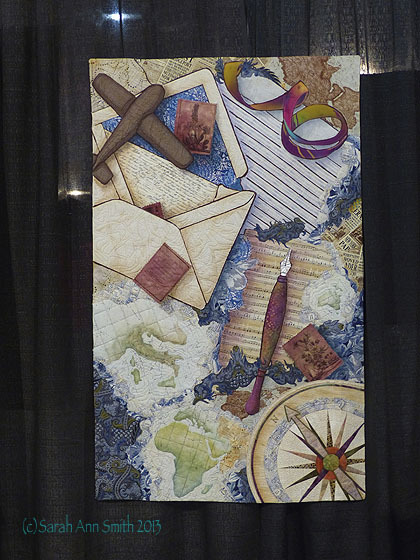 International Quilt Festival, Houston, 1 of many posts! Well it has been a very busy couple of weeks, both at Festival and re-entry coming home. I sold out of ALL the books and DVDs I had for sale in Houston, so spent my first day home unpacking, my second day home filling orders and getting them shipped out, and then dealing with all the accumulated “stuff” in my email inbox, laundry, groceries and the usual nonsense! Finally I’m at a point where I could process photos for the blog, so will have LOTS to share with you! 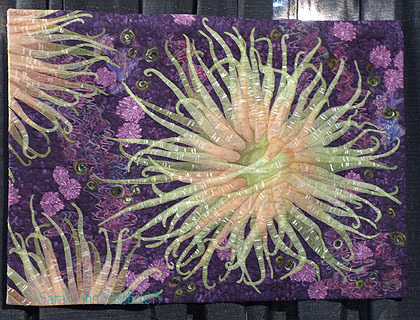 I think I’ll start with some eye candy (photos of quilts!) then go more or less in chronological order. 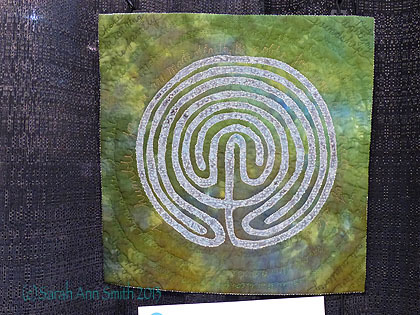 And interspersed with the Festival posts I’ll start the second/final Bloghop and Giveaway for my Art Quilt Design: From Photo to Threadwork DVD on the 12th! On Preview Night, Wednesday, I did a quick run-through on the floor to find my quilts and see what I could, as I knew I would be busy until Sunday, by which time I would be TIRED. 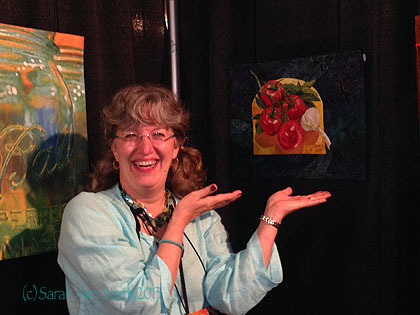 Here I am doing a Vanna White with my Tomatoes, Basil and Garlic, which was in the Juried Show. Then I went to find my quilt, Listen to the Song in the Night, in the Dinner@8 exhibit “An Exquisite Moment.” I had been worried because it is a fairly dark quilt and would be displayed on black (you can see in the photo above how the dark background on my quilt disappears into the drape!). I was relieved that it looked good! This photo was taken on Friday (I can tell because I’m wearing the Sarah-teaches-applique-vest, and that class was Friday! ), but I was pleased to see the quilt looking good! 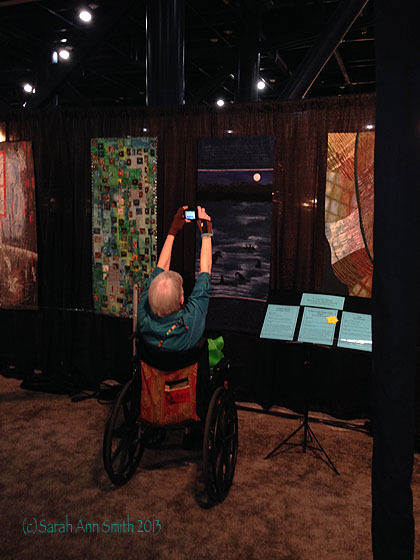 I’ll confess, I TOTALLY love taking pictures of people taking pictures of my quilts! What a rush that someone likes my work enough to want to take a picture! While doing the kamikaze run through the quilts on Preview, I snapped some pictures of quilts that really sang to me, not wanting to risk missing these when I finally had my day off (Sunday) to see the show. Betty Busby’s Desert Fox is one I returned to several times. I’ll share more pictures in a future post. 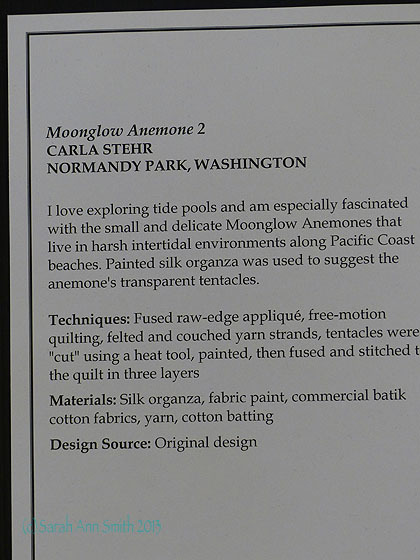 And here’s the signage from the show about the quilt above. 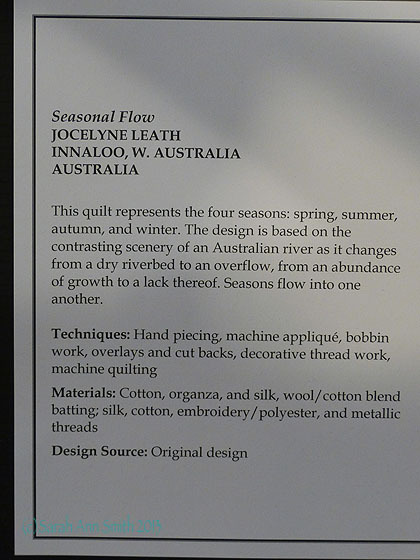 Jocelyne Leath’s Seasonal Flow was amazing…fabulous quilting, color, line. 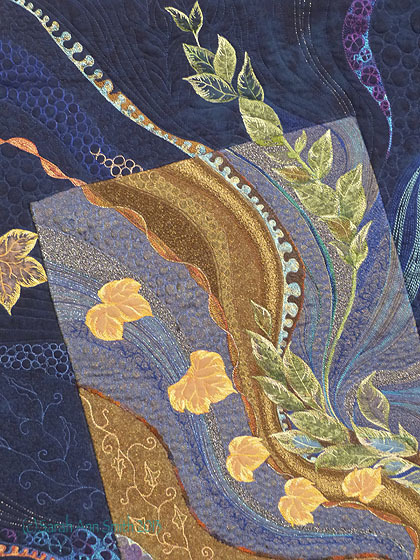 Detail of Seasonal Flow by Jocelyne Leath. Gorgeous! A few of the Silent Auction quilts, including my little green one. As I mentioned in an earlier post, I apparently (!!!) forgot to take a photo of my little quilt before it left the house. Thankfully someone bid on it, but don’t know whom to thank yet! Down at the far end (hall A), was an exhibit inspired by maps, and of course I LOVE maps! This quilt was just “the bee’s knees.” LOVE IT! 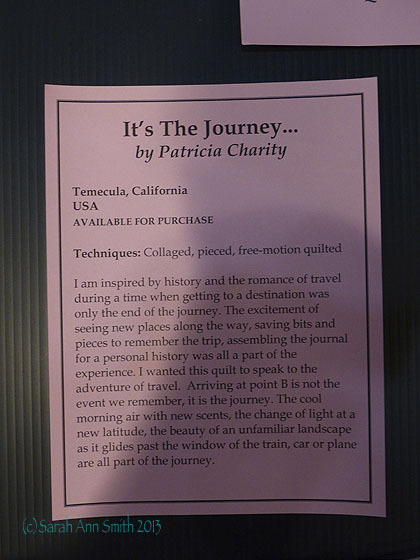 It’s the Journey by Patricia Chanty, in the Maps exhibit. The sign for the Maps quilt, above. I’ll be back soon with more pics! Glad to be HOME, had a glorious time at Festival, and look forward to next year. 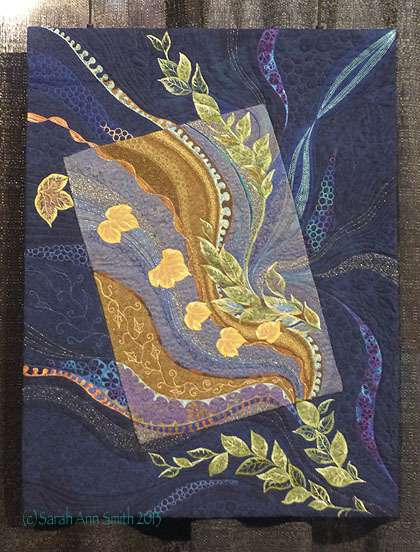 This entry was posted on Sunday, November 10th, 2013 at 1:05 pm	and is filed under art quilting, Be Happy!, International Quilt Festival. You can follow any responses to this entry through the RSS 2.0 feed. Both comments and pings are currently closed. 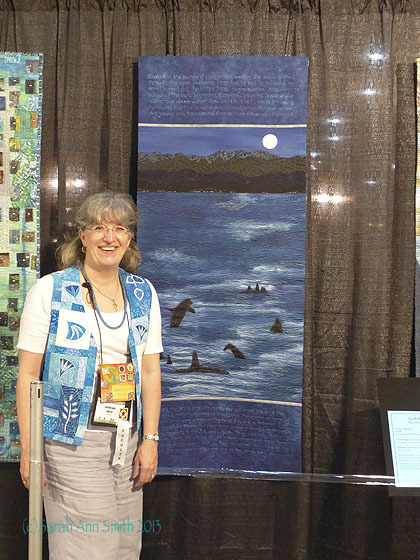 Thank you for sharing both the photos of the quilts that “sang” to you and the motivation of each of the artists. 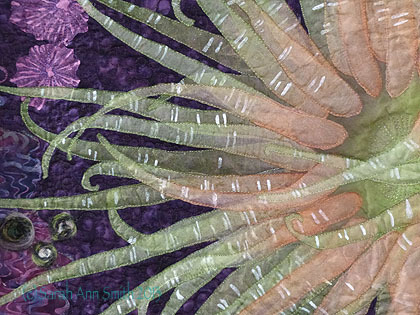 Loved seeing the pics of all these wonderful quilts–including yours! Thanks, Sarah! 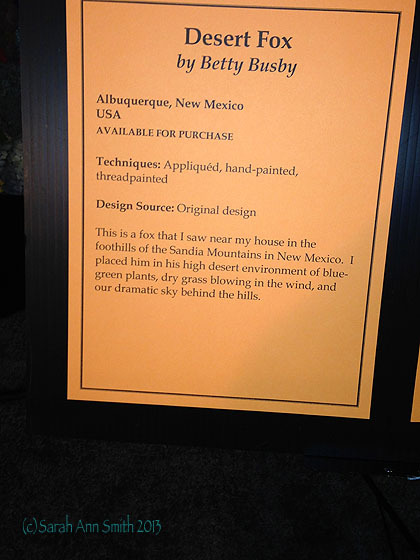 Thanks for posting my Desert Fox! It was a gorgeous Festival, wasn’t it! Thanks for sharing the photos. I loved Seasonal Flow too. And good on you for selling out your books and DVDs!!! I love how different the photos are of each visitor to festival. My shots look nothing like yours–and that’s OK! What spectacular designs and colors! Not your run-of-the-mill quilt work. Absolutely stunning works here. Thanks for posting. Loved spending a dinner with you and it must have bee such a rush to see your quilts up there. Looking at your photos (and Beth’s) it stuck me that even though I wondered through the exhibit twice, I totally missed some that you saw. Need to get my quilt pics edited and up on my blog soon.